Another treat - an interview with David Larkham – the man who controlled the visual element of the classic albums, liaising with Steve Brown, Bernie, Elton and others to bring their ideas to life. David was there at Steve Brown’s house in 68/69 with Bernie and Elton, hanging out; he was there at the Troubadour, taking photos; he was out there in Jamaica, waiting for the studio to be ready like everyone else; on tour; in Caribou… You name it – he was there. He’s still involved in bringing together the imagery that is central to Elton’s farewell tour – Elton wouldn't have anyone else doing this work for him! 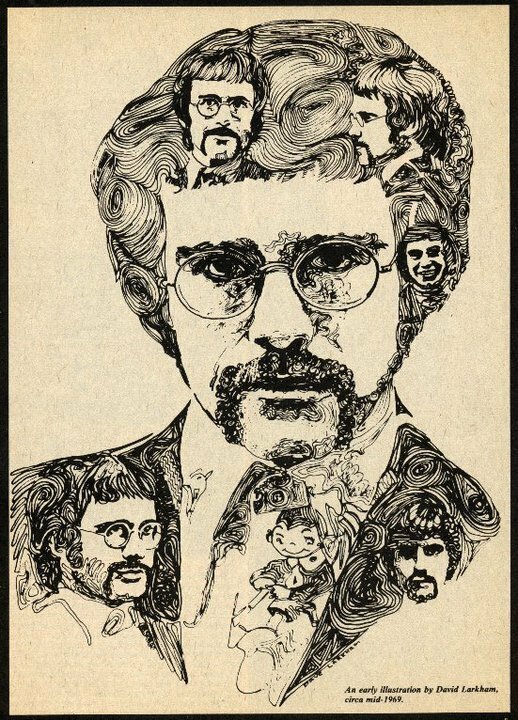 The episode image (which you can download from here) is an illustration of David's from late 1968, which was used as the front page of Elton’s first press pack, up until the release of Empty Sky. The interview about the sleeve for Goodbye Yellow Brick Road, which is mentioned in the podcast, can be found here.